Only 1,000 raffle tickets available from USA Cares for a chance to win this special edition Midnight Dragon™ rifle. Winner will be chosen on Dec. 12, 2018. Winchester, Ky. (November 2018) – DoubleStar Corp, manufacturers of high-quality, US-made AR components, rifles, pistols and edged weapons, continues to demonstrate its commitment to Veterans by donating a special edition DoubleStar Midnight Dragon™ rifle to the USA Cares Raffle. The rifle will be raffled off with all proceeds benefiting USA Cares. Tickets for the raffle cost $20 each (only 1,000 tickets are available). Visit the following link for details and tickets: https://www.tfaforms.com/4698170. “USA Cares is a great organization that helps Veterans in need, along with their families. We are proud to team up with them again this year as they raffle off a custom, laser engraved, DoubleStar Midnight Dragon rifle,” Nick Collier, director of special operations, remarked. 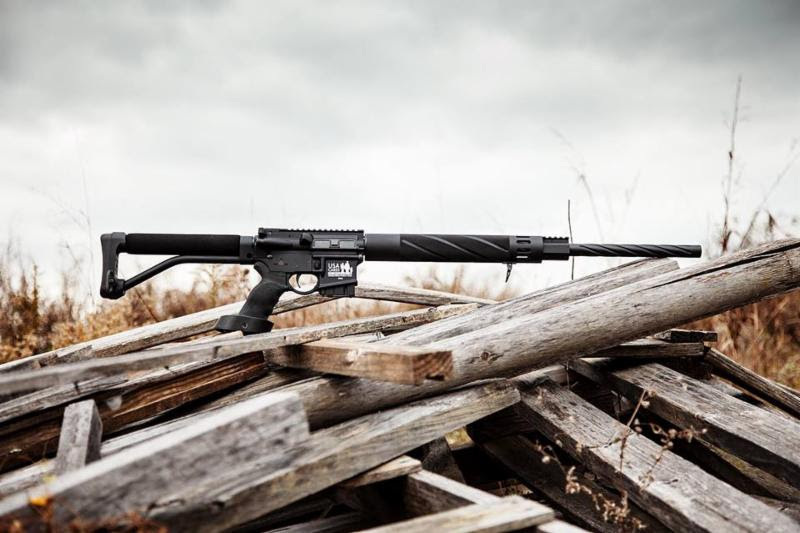 The Midnight Dragon rifle is meticulously built for long-range precision with a 24” spiral fluted, nitride-coated stainless barrel that delivers sub-MOA accuracy. A superb shooter interface is provided by enhanced accessories, like a knurled free float aluminum handguard, ERGO tactical grip, Cedar Enterprises two-stage trigger, tactical latch and fixed ARFX™ skeleton stock by ACE. What makes this firearm exclusive is the engraved USA Cares logo upon the rifle. Watch the video for more information: https://www.facebook.com/DoubleStarCorpUSA/videos/327214438059235/. USA Cares is committed to its mission to provide financial and advocacy assistance to post-9/11 active duty US military service personnel, veterans and their families. USA Cares was launched through a grassroots partnership between WAVE-3 TV in Louisville, Kentucky, the Mid-South Division of Kroger Food Stores and the Association of the United States Army Fort Knox Chapter. The organization was dubbed Kentuckiana Cares, with a goal to raise funds to help military families in financial crisis through the sale of “Support Our Troops” yard signs. In October 2003, in response to the increasing number of requests for assistance, Kentuckiana Cares evolved into what is now USA Cares, a 501(c)(3) national non-profit organization that has assisted thousands of veterans and military families facing hardships related to service. In recognition of the adoption of the Second Amendment in December 1791, the drawing for the DoubleStar Midnight Dragon rifle will take place on Dec. 12, 2018 at USA Cares Headquarters in Louisville, Kentucky at 10 a.m. EST. Entrants must be 18 years old to enter. Some restrictions apply.